The post office is still goofing with me, but the show must go on! Despite not having a few things that would make our 1950s Christmas perfect, I'll do my best to offer you a glimpse of how the holiday was celebrated back in the day. 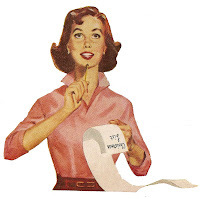 Unlike my previous 50s Housewife Experiments, I won't be yapping about what we're eating morning, noon and night but will instead tackle various Christmas-related projects like crafts, decorating, holiday wrapping, special treats and entertaining. Because my timing got buggy, some of this has actually already happened, I just haven't told you about it yet. I'll be doing "real time" projects on the blog, too. All will be revealed this week. I'm using a few different resources for this project, mainly late-1950s magazines, holiday-centric cookbooks and even a few commercials and TV shows from the time. Where possible, I've acquired the actual vintage items used - in other occasions, I've made items similar to what I've seen in magazines. Naturally, I also went out and purchased a few new things - but you'd be surprised how many Made in China items at today's dollar stores look a lot like 1950s-era Christmas crap. This one is quite bizarre. First, it's the woman begging for the appliance; second, the man says he loves mincemeat pies (UGH); and third, he's smoking in the appliance store. Where does he think he is, Montreal? I've told Patrick that although I'm dedicated to a 50s Christmas, he really need not buy me a fridge or vacuum or any other divorce-worthy present this year. Diamonds will do just fine. 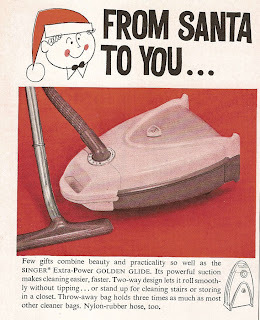 Well, this is my second Christmas in the 1950's. 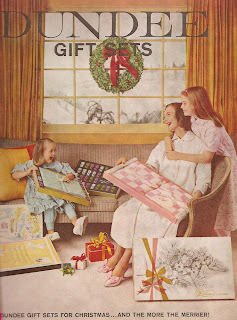 I posted some good 50's Christmas wrapping from some of my magazines today if you want to check those out. I have to say, I WOULD be excited to get that towel set and all the other gifts. Though my 1956 Kirby upright becomes a hand-held which it does once a week to vacuum the stairs and the upstairs rooms. I get as excited about vintage items as I do jewelry, but I suppose we 1950's homemakers are just made that way. Will definitely have to check out your blog, 50sgal! 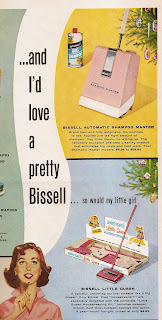 Is the original source for the Bissell ad the December 1959 Issue of Better Homes and Gardens? Do you know how to access that original source or where you were able to find that citation? 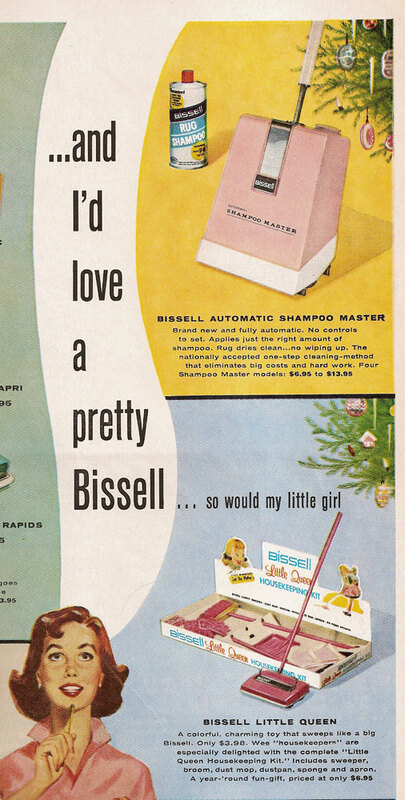 Trying to find exact source and page number for that Bissell ad to be able to cite in a paper. Any information would be much appreciated.